Darjeeling/Siliguri: Gorkha Janumkti Morcha chief Binay Tamang on Saturday lashed out at Darjeeling MP S.S. Ahluwalia, accusing him of "sheltering" party rival Bimal Gurung and ignoring hill residents' plight during last year's statehood agitation. In a written statement, Tamang questioned the BJP parliamentarian's support for Gurung, who is in hiding and faces several cases. "The MP is now claiming a conspiracy to kill Bimal Gurung and that he will provide security but we want to question him where he was when our people felt insecure during the agitation. Why did he not speak a single word when our people died? He is not a MP of Gurung only but of the entire people," Tamang said. Ahluwalia, also a Union minister, is visiting his constituency after nearly eight months, a period that saw the hills shut down for 104 days last year. The MP had declared after his arrival in Siliguri on Friday for an official programme that he would try his best to "save" Gurung from being "eliminated extra-judicially" and refused to recognise Tamang and his followers as "torchbearers" of the Morcha. 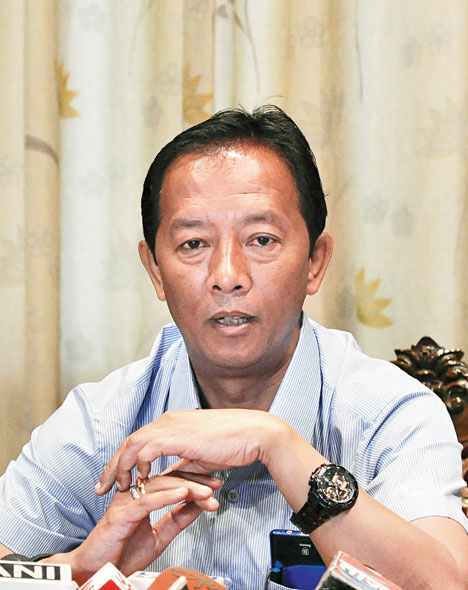 Gorkha Janumkti Morcha chief Binay Tamang on Saturday lashed out at Darjeeling MP S.S. Ahluwalia, accusing him of "sheltering" party rival Bimal Gurung and ignoring hill residents' plight during last year's statehood agitation.